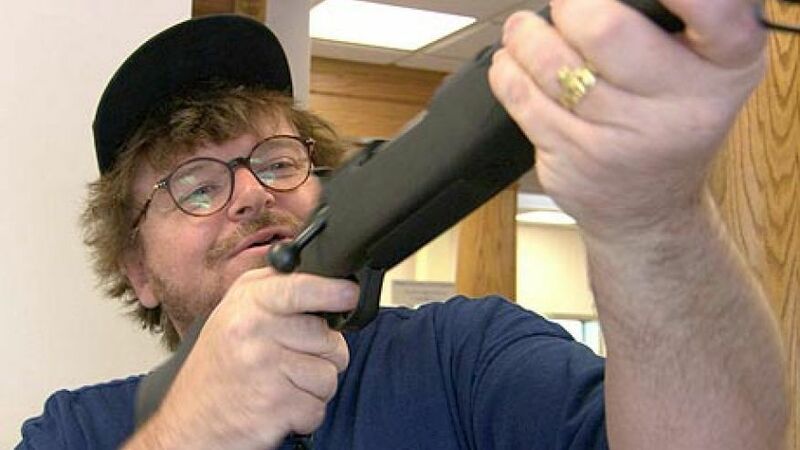 04 Oct, 2017 by	Margaret M.
The feminine filmmaker, Michael Moore, thinks the Second Amendment is “ancient” and should be repealed. Noted fat man and Oscar winner Michael Moore today urged the Congress to pass a 28th Amendment that would repeal and replace the Second Amendment. Nevermind that, as we wrote this morning, a full 63% of all gun deaths are suicides. Wait, so if I store my hunting rifle at a licensed gun club, do I clean it there too? Can I do that at home? Do I have a 24-hour window to drop the gun off in order to have the time to take the animal to a processing plant? How is this supposed to work? How about I just keep my guns to myself? According to the Wash Post, while there are over 300 million+ guns in people's homes in the US, just 3% own more than 150 million of them! Or maybe his problem is that people who own guns own too many of them. Here’s an idea. Free guns for everyone! That will also fix the issue right? Even back in 2005, we were writing about Michael Moore. In an article from 12 years ago, we noted that Michael Moore, who earned his fame on the documentary Bowling for Columbine, did indeed have security personnel who relied on guns. In fact, a former bodyguard of his was arrested for “carrying an unlicensed weapon in New York’s JFK airport.” Spike Lee attacked him for his double standard, saying: “…as far as Moore is concerned, there’s one standard for all of us peons and another standard for Very Important Liberals like himself.” He also pointed out that Moore didn’t believe that Americans should have the right to bear arms. In an interview with Donahue (remember Donahue? ), he confirmed that there should be a handgun ban, because while he respects hunters, that anything that “fire multiple rounds like that” in reference to Donahue, make a BRRRR gun noise and should “absolutely” be banned as well. Guns that go BRRRR? Are these the experts who are making grand sweeping statements on guns?